I've been meaning to get this second part of my Wallis review up for ages, but what happened was I've been too busy wearing this top and loving it so much that I forgot to photograph it, I must have worn it at least ten times since I received it! You might remember last month I told you all about the new plus size range at Wallis, this tunic is the last of the items I was sent through, and although on first look it's quite a simple piece, it just oozes style. This drop hem top, is one of my favourite items of the year, it's so wearable, it's comfortable, but looks so fresh. The raglan sleeves give it a casual feel but the satin panel to the front and sheer panels make it something really special. 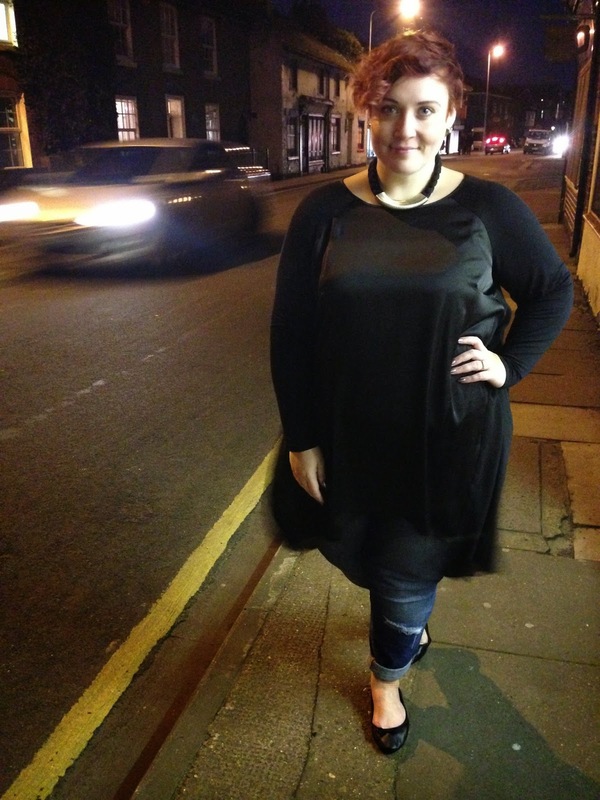 I've worn this with leggings, jeans and tights for casual and dressy occasions, it really is a wear anywhere garment. I'm wearing the 22, it's true to size and sits beautifully on. It's fitted through the sleeves and chest area then skims out which I love, it has a jersey vest layer underneath and on my 5'7" self sits mid thigh at the front, and knee length at the back. The quality is outstanding and at £20 as it is currently in the sale, you really can't go wrong. P.S Sorry if I look super tired in these shots, I haven't got any make up on and and I've been rushing around with uni work and Plus Size Awards prep this week! I'm so excited to head to London for the awards tomorrow and spend the evening with all my favourite gals! A massive thank you again to everyone who voted, you're fab! And fingers crossed eh?! I bought this the other day and am waiting for it to arrive. I wasn't sure if I like it or not, but am absolutely loving it on you! this tunic is exactly something I have been craving in my wardrobe, it is effortless and a perfect staple! You look lovely and chic!